Boating has been one of the world's most beloved pastimes since the introduction of the first marine engine in the early nineteenth century. The practical uses for boating, like transportation or fishing for food, were only enhanced by people's experience on the water. From the peacefulness one feels idling calmly on a lake to the adrenaline that goes through your body as you fight a fish as big as yourself, there are many reasons why boating and yachting has become so popular. Whether you own a center-console or a motor yacht, safety should always be your number one concern. It is the captain's responsibility to always do a thorough safety check, make sure the boat is in good, working condition, and to ensure that all coast guard rules are followed on board by all guests. Following these suggestions and guidelines will mean that your guests will not only enjoy themselves, but will return to the dock safely. Demonstrating a respect for these rules will teach the younger boaters on board good boating habits that will one day help them stay safe on the water. Having the right equipment on your boat or yacht is one of the first items on any safety checklist. There are minimum standards for your safety equipment such as having a particular grade of life jacket for everyone on board as well as a working fire extinguisher. Going above and beyond the minimum requirements when it comes to the quality of the safety items you have on board can mean the difference between getting back home safely or not. Many larger boats will sometimes carry an EPIRB, or Emergency Position Indicating Radio Beacon Station, that can be used to alert the authorities of your exact location should a search and rescue mission need to be conducted. These devices can also be used aboard smaller boats as well. It is highly recommended that the captain always review the safety features before any cruise or fishing trip gets underway. If stopped by the coast guard on a random safety check, you will be glad that you have met all of the requirements and can avoid a costly ticket. There is no greater responsibility in boating than ensuring those under your care remain safe and are aware of the rules that need to be followed. Inflatable Life Jackets are excellent protection and re-arming them is critical. That’s why having a life jacket re-arming kit is required. Like safety flares, the components on your inflatable life jacket can expire. 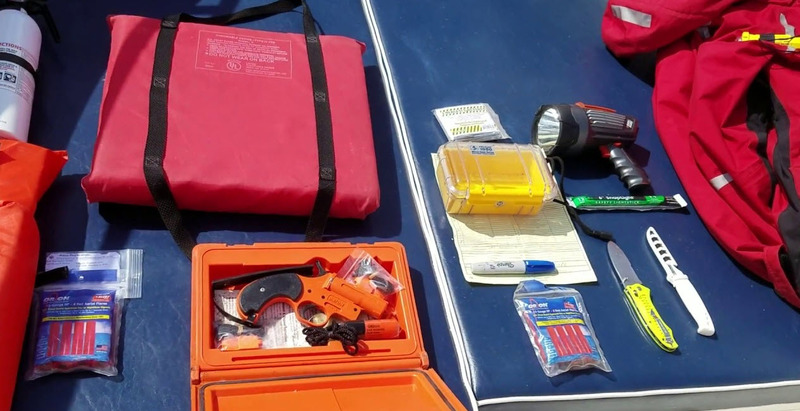 It’s not hard to find the proper re-arming kit for your life jacket. Creating a float plan is not only a responsible thing to do if you’re going boating, it is really essential to the safety of everyone on the yacht. Any vessel going offshore for fishing or cruising should have a float plan that is given to one or two people. They can be responsible for calling the coast guard if needed. 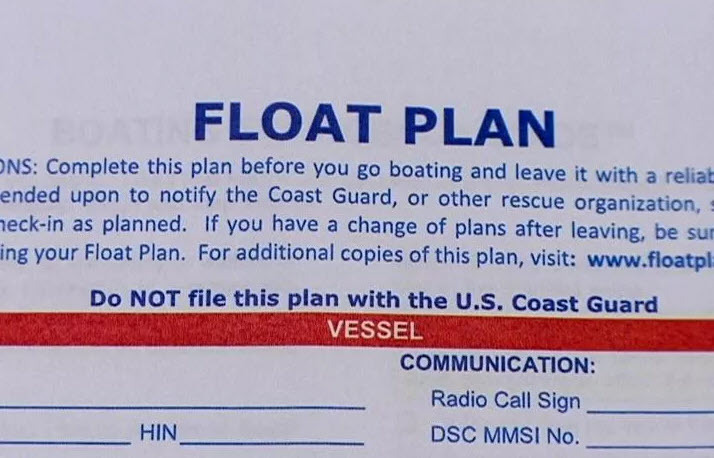 Your plan should not be filed with the coast guard, but they should immediately be notified with the plan should you not return.  A float plan shows your agenda in detail of exactly where you plan to boat, the time you will leave the dock, and your expected return time. It is highly suggested that your float plan be given to friends or family members and that you check in with them at specific times. If something were to happen to your vessel while at sea, the coast guard unit would begin following your float plan to re-trace your steps. The ocean is a vast place and searching for a single boat can be like trying to find a needle in a haystack. Large lakes and rivers can also be difficult for search and rescue teams to find a boat that may be taking on water quickly. Another hazard to being safe on the water is driving a boat after drinking alcohol. Did you know that half of all accidents that happen on a boat involve at least one of the drivers having been under the influence of alcohol or drugs? There can be severe financial penalties for getting a BUI offense, or Boating Under The Influence. Some states will even suspend your license to drive and impound your boat! Drinking on a boat, particularly in the sun, causes dehydration, impaired vision, poor judgement, and unnecessarily causes risk to the passengers on board. The U.S. Coast Guard’s program called “Boat Responsibly” has tried to tackle the problem by creating awareness and doing safety checks on popular boating holidays. Just like you would appoint a designated driver on the road, the same rule is suggested for on the water. If you are new to boating, it is recommended that you take a Coast Guard certified class to learn the rules of the waterways. There is no age minimum as to who can attend a boating safety course so bring your whole family should they wish to have fun on the water. If everyone on board your boat or yacht is educated in how to use safety equipment and what to watch out for, the likelihood of injury certainly decreases. Boating classes will also help teach you some of the rules for driving a boat like what the navigational markers mean. There are many different kinds of buoys and waterway markers in the ocean, rivers, and lakes so it is vital to understand what each one means. With so many boaters killed or hurt each year due to preventable recreational boating accidents, every captain must take personal responsibility for understanding and following the rules. Over 75% of all drownings from recreational boating occurred when the person was not wearing a life jacket. It doesn’t matter if you own a less expensive used yacht or one of the largest boats on the water, everyone can drown and no one is above the law. Educating yourself as a boat owner and a captain can not only help save lives on your yacht, it also teaches those are you to have a healthy respect for the rules of the water. United Yacht Sales is also proud to offer a yearly college scholarship for deserving students that uphold the same ideals as our team.